This blog was set up to to collect public comment during our Feasibility Study (PDF), which is now complete. Please visit our new web site at oregonsustainabilitycenter.org for updates on the Oregon Sustainability Center. Thank you to everyone who attended last week’s open house at PSU, which very nearly filled the annex of Shattuck Hall. With introductions by Mayor Sam Adams, PSU President Wim Wiewel, Jim Francesconi of the Oregon State Board of Higher Education, and the Governor’s Sustainability Advisor David Van’t Hof, and presentations by Mark Edlen of Gerding Edlen Development, Andrea Durbin of OLBI, Jennifer Allen of PSU and the OSC research team, and Lisa Petterson (SERA) and Kyle Andersen (GBD) of the design team, there was plenty to discuss when the program later dispersed into smaller, focused clusters of Q&A. If you missed the event, you can download the presentations here. In the meantime, this blog will remain live and open for comment. Posts will be less frequent, but if and when events arise and decisions emerge, we’ll be sure to share. Thank you for your ongoing interest in the Oregon Sustainability Center. Enjoy the summer, and stay tuned for Phase Two. The preliminary draft for the executive summary of the OSC feasibility study is now available for download and review. Click here for the complete PDF. 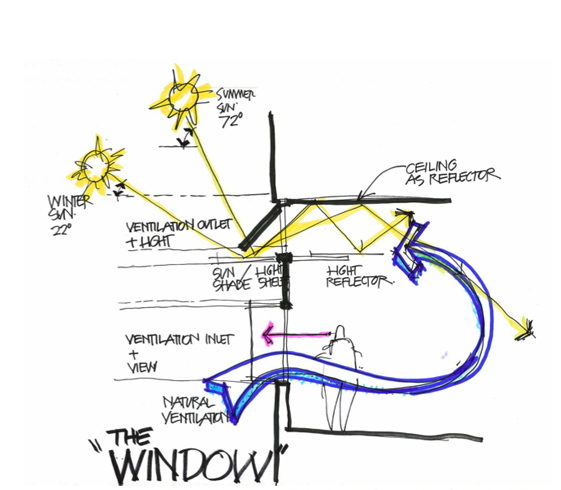 The Window: part PV panel, part light shelf, part sun shade, the Window concept for the OSC is one example of a design that, with further research, could yield a successful integrated economic development strategy for the regional building industry. 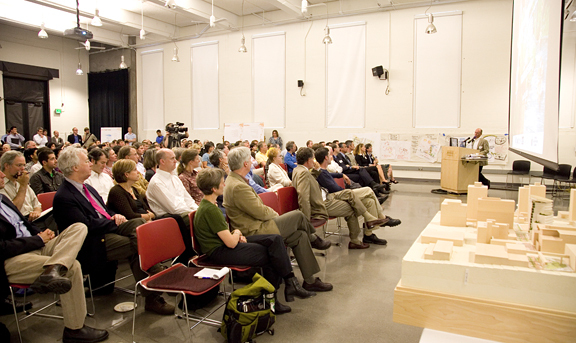 For the Living Building Challenge, defining the problem is half of the solution. But three PSU students might tell you that defining the problem isn’t always easy. These students helped the OSC research group with several items on their 90-day agenda, which aimed to answer the questions most pertinent to the feasibility study. So what makes defining the problem so hard? For one, the students catalogued every ingredient on a list of 250 materials to see if they contained any items on the Living Building Challenge’s Red List. They weren’t finding alternatives to these materials, they were finding what they contained – an arduous task of poring over specifications, Material Safety Data Sheets, and a host of other sources. They found that 25% of the 250 materials that the research group suspected actually contained one or more of the Red List chemicals. That’s about 63 materials for which the team will need to find an alternative. As stipulated by the Living Building Challenge, the materials need to come from within the materials service radius. Once again, the students dove into the data, looking for companies within 250, 500 or 1000 miles that carry products needed to build the OSC. And the number of usable materials crept even lower. But knowing constraints often opens up the biggest opportunities. The research group constantly kept an eye out for opportunities to grow local business. Often enough, local businesses are making materials in the region, but use, say, urea formaldehyde in the process. So why not ask them to cut out the nasty chemicals and create a new market? Or, businesses are making the perfect product, but they are based overseas. Why not suggest they open a manufacturing branch in Portland? Or even better, why not find a local entrepreneur to create an entirely new business to meet the need? The Box Beam: Dubbed the “seven-fer” for its ability to perform seven critical functions within a single design, the Box Beam concept – which emerged early in OSC brainstorming – is a pre-fabricated concrete form that could provide: Structure; Passive heating with the slab; Radiant heating and cooling; distribution for ventilation; Finished ceiling; Chase for data and cabling; Chase for fire sprinklers. It could also spur innovation in the regional economy by teaming existing pre-cast concrete manufacturers with radiant piping suppliers/manufacturers, data suppliers, cabling suppliers, and local expert green engineers (structural, mechanical and plumbing) to develop a new, replicable green building product. Other more immediate tasks on the 90-day agenda included finding the projected increase in efficiency of PVs over the next two years (experts project about a 1-2% increase), finding weather station data to help inform mechanical and passive system design (thank you to David Sailor and the Broadway Building weather station), nearby parking garage energy use (no longer relevant with net-zero energy achieved on site, but much higher than expected) and analyzing the building’s optimization for daylighting (local expert G.Z. Brown recommends a “thin building” approach). If you have interest in contributing to any of the above research topics, join us at the Open House this coming Thursday, June 25th, from 5-7:30 pm at PSU’s Shattuck Hall Annex, where we will be discussing the project’s next steps in greater detail. 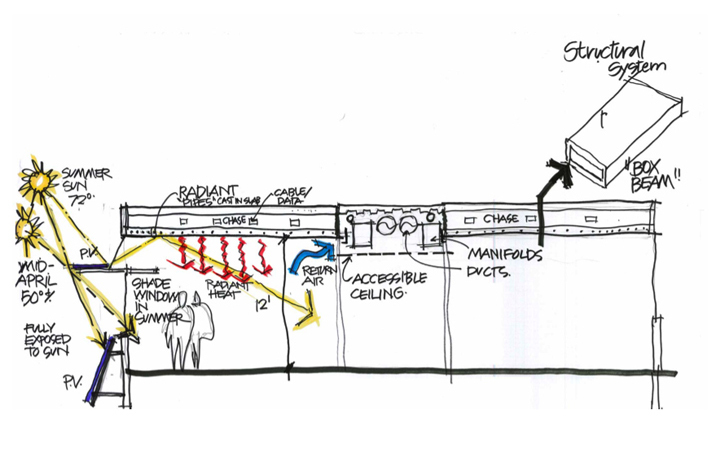 Sketch of rainwater’s course through the OSC. Courtesy GBD. So says the Living Building Challenge (LBC), and so will be the Oregon Sustainability Center, employing water conservation measures that will complement a comprehensive rainwater collection system and an on-site sanitary wastewater treatment system, the Living Machine. 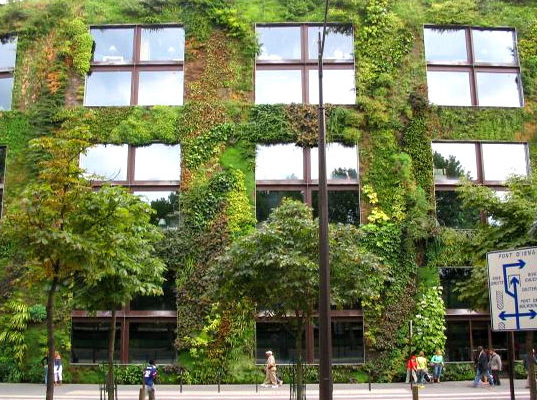 Example of a green wall, one potential stop for storm water on its path through a living building. Courtesy inhabitat.com. Prerequisite 10 – Net Zero Water 100% of occupants’ water use must come from captured precipitation or closed loop water systems that account for downstream ecosystem impacts and that are appropriately purified without the use of chemicals. Prerequisite 11 – Sustainable Water Discharge 100% of storm water and building water discharge must be managed on-site and integrated into a comprehensive system to feed the project’s demands. Storm water flowing into a bioswale near Mt. Tabor (click to enlarge). Photo courtesy Kevin Robert Perry. Given the rainy climate of the Pacific Northwest, water issues are of particular interest around here. According to the City of Portland’s Bureau of Environmental Services, it rains an average of 37 inches in Portland per year. This yields roughly 10 billion gallons of storm water runoff, the volume and speed of which leads to flooding, erosion, natural habitat destruction, and, potentially, combined sewer overflows (CSOs). Such an abundance of rain feeds the regional misconception that water conservation issues are of a lesser concern, yet as the LBC points out, a lack of regard for water use today, coupled with the mistreatment of the water that does get used, is foreshadowing a significant environmental crisis just around the bend. This challenge has driven the OSC team to commit to strategies to achieve net zero water that will in fact move the project much further, toward a goal of hydro equity, giving back to its local ecosystem clean water that it does not need. 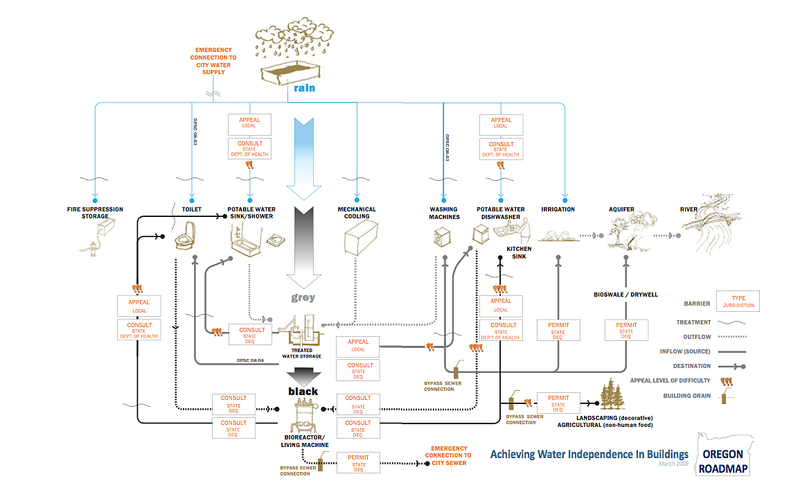 The Oregon Road Map for Achieving Water Independence in Buildings (click to enlarge). This study was prepared by a team from Gerding Edlen Development, Central City Concern, SERA, and Interface Engineering, with funding by the Bullitt Foundation, Cascadia GBC, Enterprise Community Partners, and Portland Development Commission. You can find the complete report here. Similar to the building’s strategy for net zero energy, the design team added water conservation measures first, incorporating into the basis of design the lowest flow fixtures available on the market today, most of which will be equipped with optical sensors. To achieve net zero water, the building will collect rainwater for potable uses from the rooftops. As described in earlier posts, a 6,200 square foot bifacial photovoltaic (PV) array on the 4th floor of the building, and a 3,000 square foot bifacial PV array on the 3rd floor, will create a translucent canopy covering the OSC’s ground floor plaza. Organically shaped PV arrays will also top the building, once on the 10th floor, and a second time on the very top, adding another 18,400 square feet of impermeable surface. Bird’s eye view of the OSC solar canopies (click to enlarge). Collectively, the PV panels (along with other impermeable surfaces throughout the site) will double as rainwater collectors, sending the water into a 200,000-gallon epoxy lined waterproof concrete storage tank, which will be fitted with circulation pumps to circulate water within the tank, preventing stagnation. The rainwater will be treated via filters and a chlorine injection system before being pumped and/or circulated into a 500-gallon/day tank. A duplex pump system will draw from this day tank and deliver the treated rainwater for potable uses throughout the building. 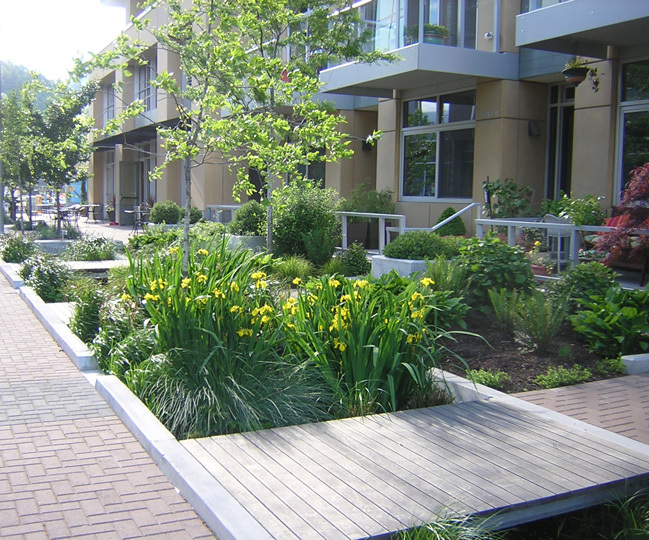 Swales as part of the stormwater management plan for Portland’s South Waterfront. Photo courtesy Nevue Ngan Assoc. 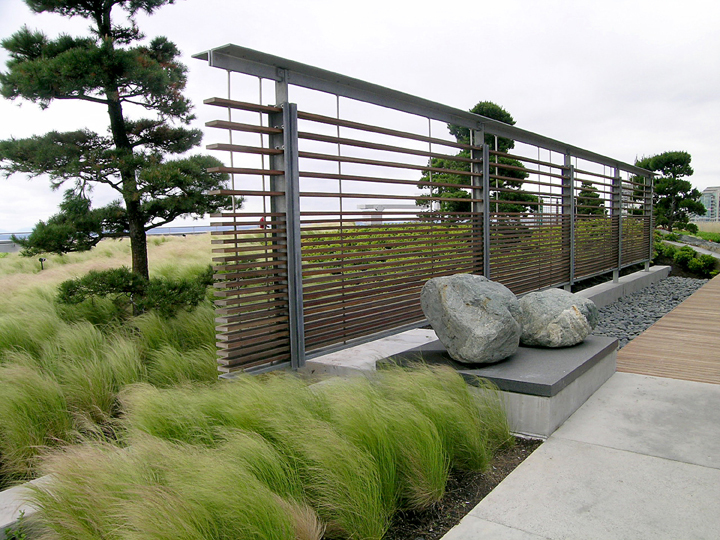 On the ground level, porous pavement, vegetated planters, and bioswales will also contribute to the management of the storm water that is not captured by any of the rooftops. Together these features filter and slow the flow of rainwater as it makes it way back into the ground. 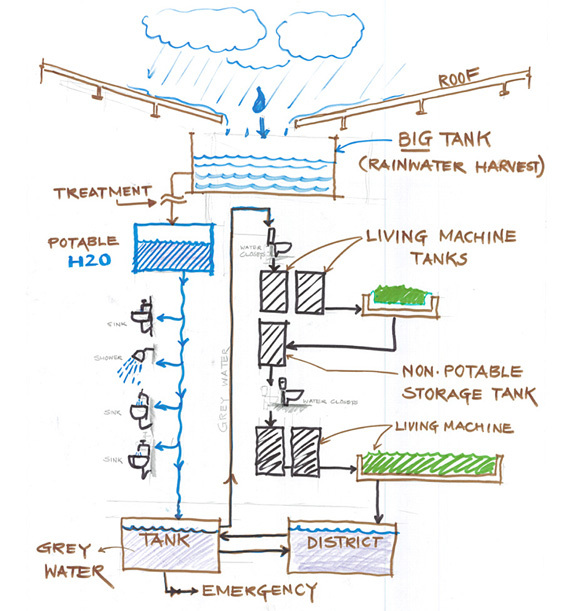 To address Prerequisite 11, Sustainable Water Discharge, the OSC design will incorporate an on-site sanitary sewer system that is known as a Living Machine, chosen both for its low energy use and derivation from biophilic design. Living machines mimic the natural cleansing processes of wetlands, employing plants, bacteria, algae and other organisms to do the hard work of filtering black water. The OSC’s system will include an initial screening and collection of solid materials from black water sources (ie. toilets) for use as compost and fertilizer for onsite landscaping. The treated effluent from the living machine will be reused for flushing toilets and urinals and at hose bibs. Green roof on a Washington Mutual building. Photo Phillips Farevaag Smallenberg. All excess storm water and treated wastewater that is not used internally will be either infiltrated back into the soil on site, where it will replenish the groundwater supply, or it will be used to irrigate gardens and green roofs throughout the building. Ideally, the excess storm water will also be funneled back to the Montgomery Green Street for irrigation there, as well. While the OSC itself will do the lion’s share of the work to achieve net zero water, through its extensive catchment and filtration systems, ultimate success still relies on the active participation of the tenants in the building. Metering the tenants’ use of water will be imperative, and the team is looking into metering systems for each office and retail space, to track usage on a daily, or even hourly, basis. Water bills will vary according to each tenants’ level of consumption. But will that be enough? What if, as was discussed during one recent steering committee meeting, tenants had to swipe a card before using a toilet or urinal, so that every last drop of water consumed was tracked and accounted for? Sounds crazy to some, but for others such a step would be prescient. Not long from now, will we have any other choice? 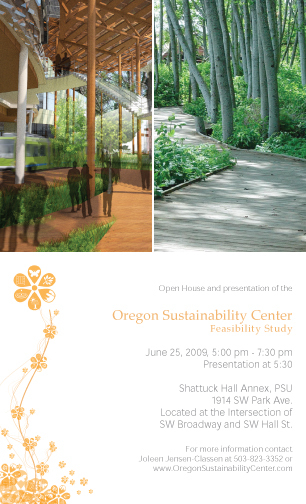 The feasibility phase of the Oregon Sustainability Center is drawing to a close. Please join us at our Open House on Thursday, June 25th, to see presentations on the latest designs, and to discuss any and all questions you might have about the project’s past, present, and future. Portland State University Shattuck Hall Annex, 1914 SW Park Ave. The formal presentation will begin at 5:30. Ask Omid Nabipoor of Interface Engineering about energy strategies for a net zero building, and he’s likely to tell you first about a towel. For emphasis, he gestures with his hands, twisting an invisible towel, and we imagine a stream of water – all the inefficiencies of a standard office building – spilling onto the floor. Sounds easy enough. Eliminate waste, first. Gone is the soggy (conventional office building) towel. Make note of the inefficiencies that comprise the puddle on the floor, and cut them from the building’s design. 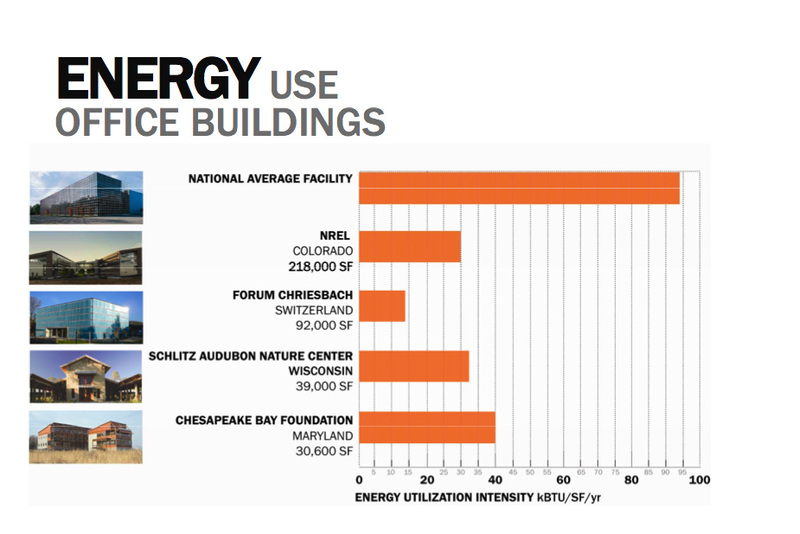 Next, design the highest performing building envelope possible, relying on passive energy systems primarily, and the most highly efficient active energy systems where necessary, and hey presto…a well wrung-out towel becomes a net zero building? Not quite, but it’s a good place to start. Assuming efficiency as the first step…back to Omid Nabipoor and his wrung-out towel. Just how efficient is the OSC striving to be? 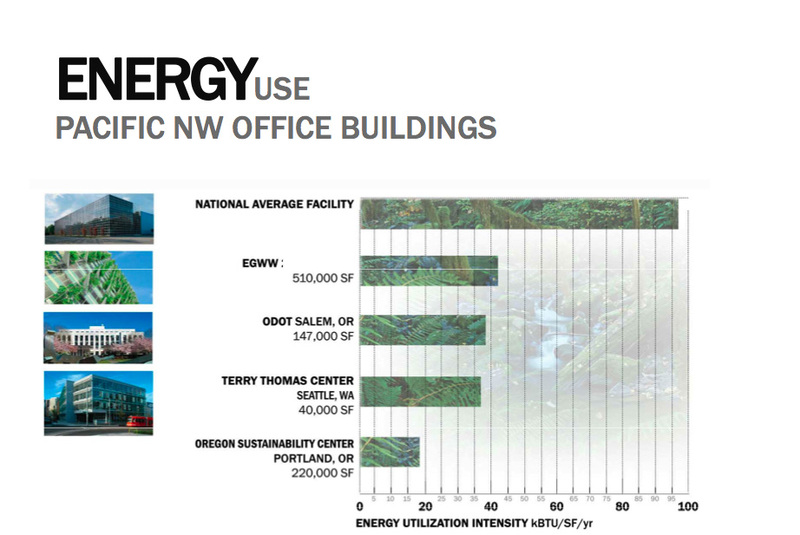 According to the 2003 Commercial Building Energy Consumption Survey on energy use in office buildings, published by the Department of Energy’s Energy Information Administration, the average facility in the United States has an EUI (energy utilization intensity) of approximately 92 kBTU/square foot/year. With Oregon’s more stringent energy code and the climate of the Pacific Northwest, the EUI average around here drops closer to 74. The Terry Thomas in Seattle, ranked last year as one of the Top Ten Green Projects by the AIA, has an EUI of 37. The Oregon Sustainability Center, by comparison, has set an EUI goal of 18-20. 35% vision glass that will be triple glazed with an overall glazing to be tuned to respond to each elevation. For example, the south side will have a higher shading coefficient and the north side will have a higher U value. Exterior shading devices with integrated photovoltaic panels to generate electricity while reducing heat load on building. Interior light shelves will help bounce daylight deeper into the interior spaces. Single gender bathrooms on alternate floors, which will make the floor plate more efficient. With each of these features and strategies plugged into the OSC’s energy model, the building achieves an EUI of around 23 kBTUH/sf. Bringing the EUI down to its final targeted range requires the engagement of the least predictable component in the building: the tenants themselves. The design team has added to the OSC energy model the following occupant enhancements, changes to typical office usage that are dependent on the building users, and that, if successful, will bring the building’s EUI down to even less than their original forecast, to 17.7 rather than the targeted 18-20. 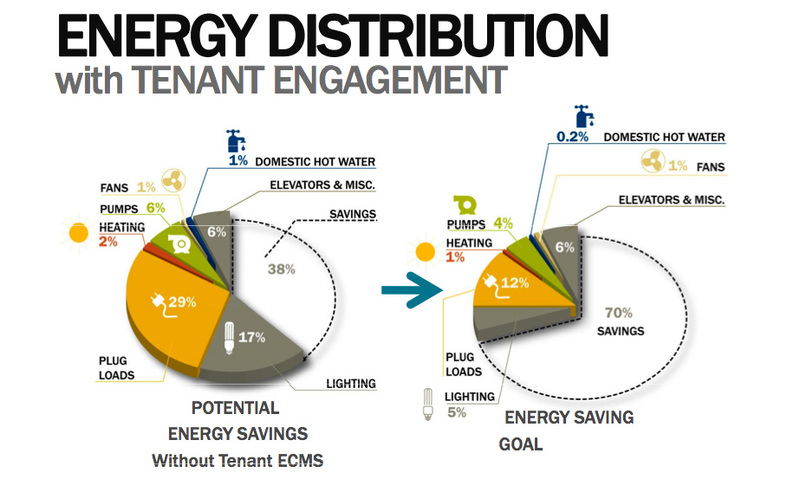 Tenants will be able to actively draw comparisons between different plug loads (from task lighting, space heaters, small appliances) as well as compare their energy usage power metering, with software that provides power quality information and feedback on actual power usage compared to others in the building. At the individual scale, feedback will be possible with either a plug strip with integral power metering or a plug-in meter for workstations in open areas. The team is still looking into additional enhancements such as thin client technology and a DC (direct current) loop, which would allow the energy generated by the photovoltaic panels (described below) to go directly to an end use without changing its current type (thereby eliminating the inefficiencies that come with conversion from DC to AC power). After all energy conservation measures have been included, the nearly final push for the building’s net zero strategy will be the incorporation of photovoltaics (PVs). For the building’s energy model, PVs were analyzed using the most efficient panel on the market today – the Sanyo HIT 205. 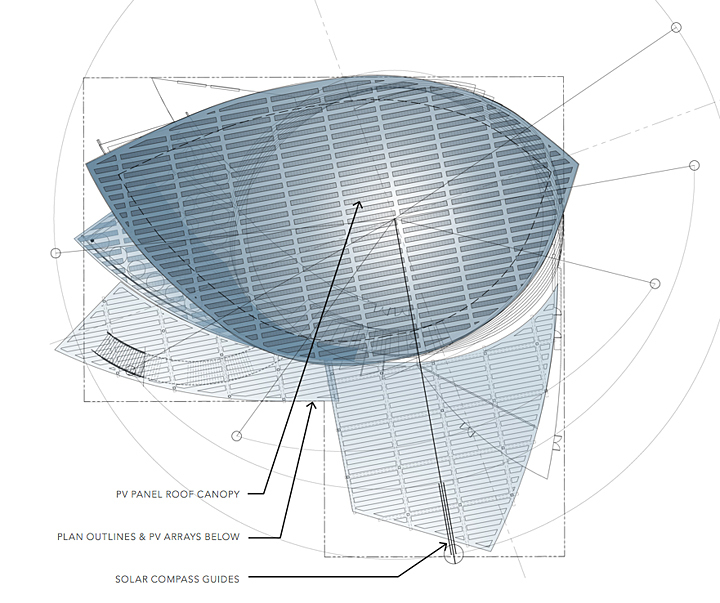 Bifacial PVs are also being considered, for the soaring canopy panels described in our previous discussion of the ground floor design. The OSC rooftop, 10th floor canopy, sunshades, and plaza canopies contribute more than 85% of the energy needs of the building, while building integrated photovoltaics at the south facing spandrels account for the rest. Altogether, the building has approximately 54,000 square feet of PV. Greatest efficiencies, passive and active energy sources…so what, then, is the final-final push for net zero energy? As usual, the final responsibility for the success of a Living Building floats back to the people. We won’t know whether the OSC will reach its 17.7 EUI, or its net zero energy strategy, for a couple of years. Planned efficiencies and sourcing from renewables takes us halfway there. The rest is up to every individual who commits to working in the building each day. At the risk of becoming a broken record, we’ll say it one more time: People are (still) the life in a living building. Many thanks to PDC’s John Cárdenas for creating the video. Meandering streams, a canopy of trees, dappled light dancing across a ground cover of native grasses and shrubs…and then the streetcar rolls through. Hang on…where are we? We could be at the entrance to the OSC. Since last week’s critique, the team has been tinkering with the project’s urban design – looking at how the OSC will integrate with its greater place. Two key factors influence this: the site’s drainage, and its context. Site analysis, with an eye for its natural drainage and relationship to surrounding blocks. The first bit’s simple: water flows across the site from its highest point at SW 5th and Harrison, to the north and west, funneling into Montgomery, and eventually to the Willamette River. The second bit – looking at the site within its greater context, at the edge of an urban campus, surrounded by a bustling commercial and residential district – is inspiring. For the OSC, the projects that have most directly informed early designs are PSU’s Urban Plaza, to the northwest, and the Halprin sequence, a series of linked open spaces to the east that were designed by the office of Lawrence Halprin in the 1960s. A quick look at each reveals that many principles for this new project’s urban design have been in place for years, the OSC offering the next evolution. A study of the “ecology of form” by Lawrence Halprin. Courtesy HLC. 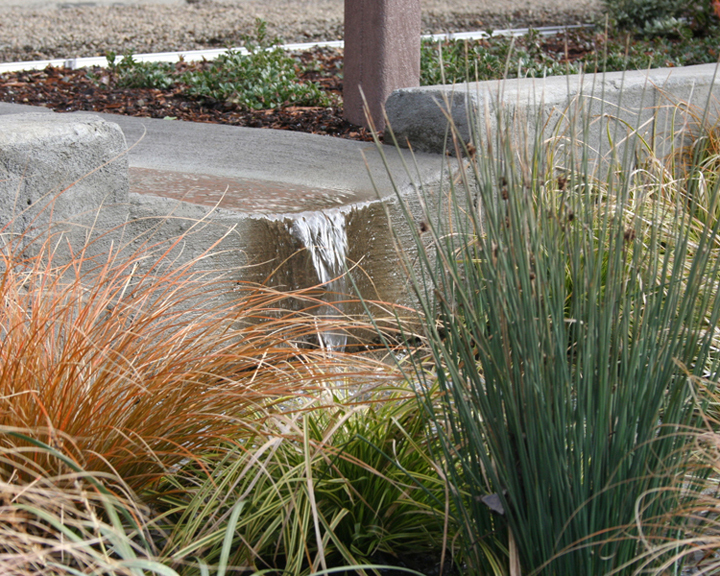 Taking cues from the topography of the Cascades, Halprin’s eight-block series of parks and plazas (Portland’s first “green street”) starts with a Source Fountain at its southernmost tip, moves to the Lovejoy Fountain (high desert), passes through Pettygrove Park (the foothills, meadows, streams), and culminates at the Ira Keller Forecourt Fountain, which, with its dramatic water features and vegetation, are a nod to the northwest’s alpine landscape. The Urban Plaza, currently under construction to make way for the new Rec Center. By contrast, the PSU Urban Plaza, completed in 2000, is an eastern gateway to the urban university campus, an important throughway at SW 5th and Montgomery for the streetcar, MAX, and thousands of pedestrians who either pass through in a hurry, or who stop, sit on steps, eat lunch, and bask in the sun. Fittingly, its open-air design takes a classical approach; it is a piazza, a rectangular room with classically defined edges, semicircular features, and hard surfaces that combined reflect the ethos of the studies taking place in the building on its site, the College of Urban & Public Affairs. From an ecological perspective, having such divergent landscapes flanking its site begs the OSC to serve as a transitional zone, and the design team is moving forward with this in mind. Studying the yin and yang of the OSC and the Urban Plaza. Taking Halprin’s idea of complementary opposites very much to heart, Kurt Schultz of SERA saw the OSC’s own urban design as the Yin to the PSU Urban Plaza’s Yang. He also saw an opportunity to add a new tributary to the Halprin sequence, one that is a Cascadian forest floor, a natural transition from the harder landscape of the Urban Plaza, to the west, to the softer, greener Halprin “river”, to the east. Landscape plan for the OSC site. The transition will be dramatic. Working with landscape architects from Nevue Ngan and Associates, the team envisions the OSC’s ground level experience as akin to a walk through our native forests. Photovoltaic panels that are soaring overhead – integral to the building’s energy strategy – will be translucent, creating dappled light rather than total shade, and large wooden columns will hold the panels in place. Walking through the plaza, one is immersed in an understory of trees, a quiet, sheltered space that is in stark contrast to the bustling open Urban Plaza across the street. Softer surfaces such as raised wooden boardwalks reinforce the forest experience, as they cross over meandering streams, small open runnels that are carrying stormwater from the building and the site down to the Montgomery green street, the district’s major “river”. The streetcar tracks, which cut diagonally across the site, will not interrupt this forest, but will instead be enveloped. While not unprecedented – grassy tracks have cropped up throughout much of Europe – the grasses and trees between and around the streetcar at the OSC will be native. Continuing this theme into the building itself, the team is looking into wooden finishes for the ground-floor ceiling, so that as visitors pass from the outside in, the distinction between the natural and built environment remains blurred. This also introduces wood, at an early stage, as a material that will be used repeatedly throughout the building. The OSC, lower right, can be approached from all sides, leaving its primary entrance ambiguous. Equally unclear – in a good way – is the location of the building’s front door. As is characteristic of many university buildings, visitors will be entering and exiting the OSC from all sides. Students will access classrooms and the conference center from a grand staircase that starts from the direction of the Urban Plaza, climbs over the streetcar and enters the building on the second floor. Other visitors, perhaps wholly unaware of the university across the street, will come in from Montgomery, lured into the building by its uninterrupted flow of greenery from the street to the building’s rising green wall. Once inside and on the upper floors, the building’s torque – the four degree rotation that occurs on each floor – is directed back toward PSU’s Urban Plaza, the OSC’s curved edges reaching out and across to the Urban Center’s straighter lines. The yin and yang dynamic emerges once again. Sketch of the Portland sequence by Lawrence Halprin. Courtesy HLC. The urban oasis, a great escape, without ever leaving the city. While Halprin wasn’t the first to provide this for Portland (think Park Blocks, Forest Park), he certainly set the tone for this SW Portland neighborhood, and in its wildness and reverence for the ecologies of our region, it is a tone the OSC intends to keep.